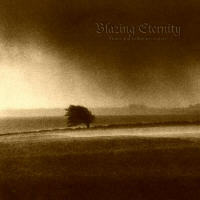 BLAZING ETERNITY is an Atmospheric Doom Metal band from Denmark. Who would have thought BLAZING ETERNITY capable of such development? Both of the demos ‘Over Sorte Heder’ (1995) and ‘Der Hviler En Nat Under Sorte Vinterborge’ (1997) have already proved their songwriting excellence which is seldom reached in today's underground. An album such as ‘A world to drown in’ however would have been unthinkable at the time. Although the last titled tape brought about a record deal. 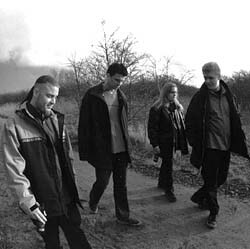 ‘Times and Unknown’ the debut album from the Danish formation was recorded some years later under the direction of Markus Stock in the studio E Form. Made up of black metal and melodies it makes you think of the great Katatonia at times. BLAZING ETERNITY carve out their own style with Nordic Night Metal. 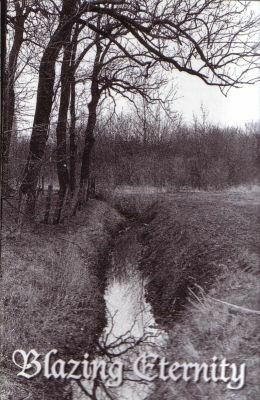 At that time new songs such as that of ‘Of Times and Unknown Waters’ were joined with the newly recorded demo classics above all the melancholy darkened by Peter Mesnickows grim, sometimes dreamy, sometimes bitter voice. 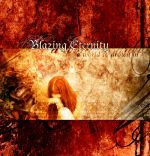 The second album „A World To Drown In“ was another big step forward for BLAZING ETERNITY. The structure of the songs stays manageable, an ever more heartgripping melody with a catchy refrain. Though the most moving thing on it is Lybeckers singing which suppressed the harsh vocals and shows much heart. These are emotions that stay on the tip of the tongue presented so strongly that you can only lose yourself in it. With that bare of emotion to speak of the empty horn of plenty of feelings can hardly be reckoned with. As it knocks on tender yearning there gleams pure despair. A heart was taken here for BLAZING ETERNITY.